Our baby is sitting at the dealer now. Here’s whats happened since the last article about the break-in. We called the dealer the afternoon before we were set to leave the RV Park at Lake Elsinore. We talked to the service rep. He seemed to be very anxious to help, and told us we could bring the coach over the next afternoon. Packing up and leaving the RV Park the next morning went very smoothly, and we were out of there about half an hour earlier than I expected. First stop was our RV Storage lot. We had to unload the coach before taking it to the dealer. This included the cat….he was much easier to get into his carrier this time than he was the first time. Once we had everything that needed to come home loaded into our Honda Accord, we were on our way to the dealership. It is about 4 miles to the east. I pulled up into the staging area next to the service counter and walked in. Our service rep was ready to take care of me, even though I was about an hour earlier than I told him I would be. “Earlier is better,” he said with a smile. We walked out to the coach. He took the usual info – mileage, license plate, and so on. He took a look at the window and the torn screen. As I expected, he said that they would have to order a new window assembly from Forest River. He thought it would take a couple of weeks to get the part and get it installed. I’m also having a couple of warranty issues taken care of….a leaky black water tank valve, and a stuck water filter housing. Both are minor, and the service rep thought they would be quick and easy to take care of. The service rep tried to sell me a couple of things. One was some suspension stiffening springs that they have “on special” for about $2500, and the other was a solar system that they had on sale for $1050. I am interested in the solar, but don’t want to spend the money on that yet. I think the coach handles fine, even without the “Cheap Handling Fix”, so I have no desire to drop over two grand on the suspension fix. After signing several copies of the paperwork, one set for the break-in repair and one set of the warranty work, we were done. My insurance guy called the dealership as promised the next morning, and got things set up. The bad news is that the deductible on the insurance is $500…..and the cost of the repair probably won’t be much more than that. So, what’s next? We have the storage yard to deal with. It’s obvious that security at the yard is not what it was advertised to be. There were no cameras that covered the back bay area where the 19 coaches got broken into. They advertise a security person “in residence”. That person was not at the yard at all for the entire night…..the only thing that stopped the burglars was a fellow customer who arrived at around 3:00am to drop off his truck. He saw the people there and chased them away. We got a letter and e-mail from the owners of the storage yard, telling us about the improvements they’ve made, and what they plan to do to make things right. The improvements they made were minor. They put re bar over a drainage hole in the fence, down at ground level. That is a small opening. I doubt if that is how the burglars came in. The other thing they said they would do is add a new security camera system. I’ll see if that’s there when I show up at the yard after our coach is finished at the dealership. What are they offering to do to make things right? They are giving us one month at half price. LOL. So we get half of $119 bucks. I’m going after them for the entire $500 deductible, and I know for a fact that other tenants are doing the same….we talked about it when we were there talking to the Sheriff’s Department the morning after the event. If these guys balk at paying us for our damages, we will have to find another storage yard. I’m sitting on the couch in Redondo Beach, tired but happy. Laura and I just got through our third RV trip. This was another learning and shakedown trip. It was our longest to date – four days. I wish it could have been longer. 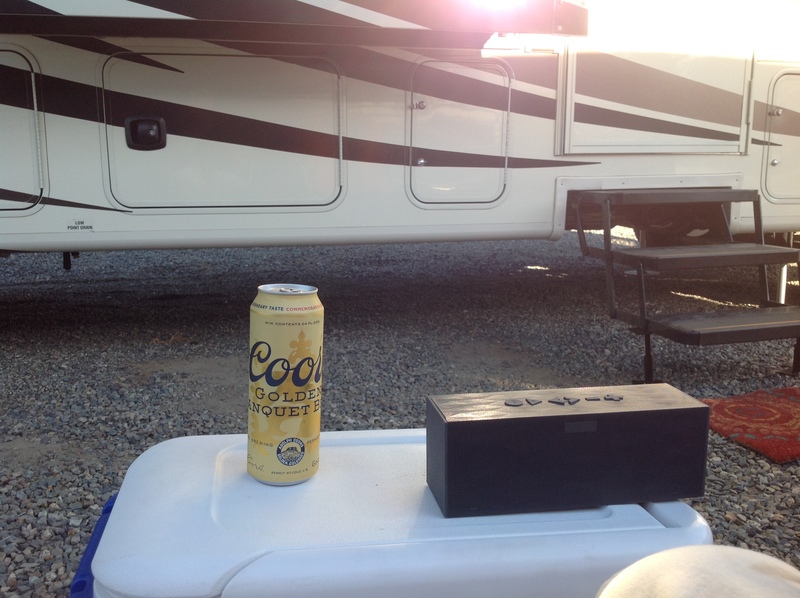 We tried out a couple of new facets of the RV lifestyle. And second, we tried out our new membership in Passport America to get our nightly cost down to something a little more affordable. This was not a “destination” trip, meaning that we didn’t go to a place that had lots of great sights and activities. We went instead to a Passport America park that had reasonable rates and was not unbearably hot in June. 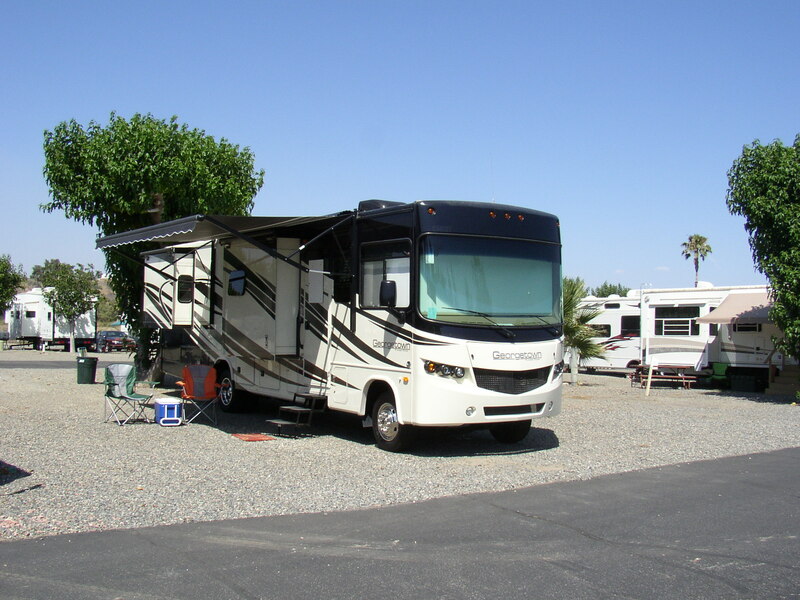 The place we chose was Lake Park RV Resort and Lodge, which was one of two places that Passport America had listed on Lake Elsinore. We got two of our four nights for half price. The entire four nights cost just $105. 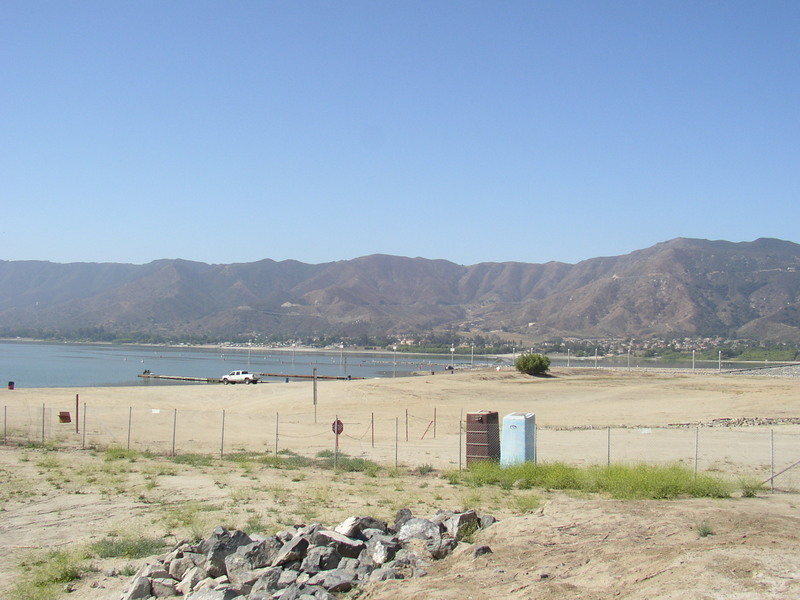 Lake Elsinore is in the Inland Empire, close to Temecula. 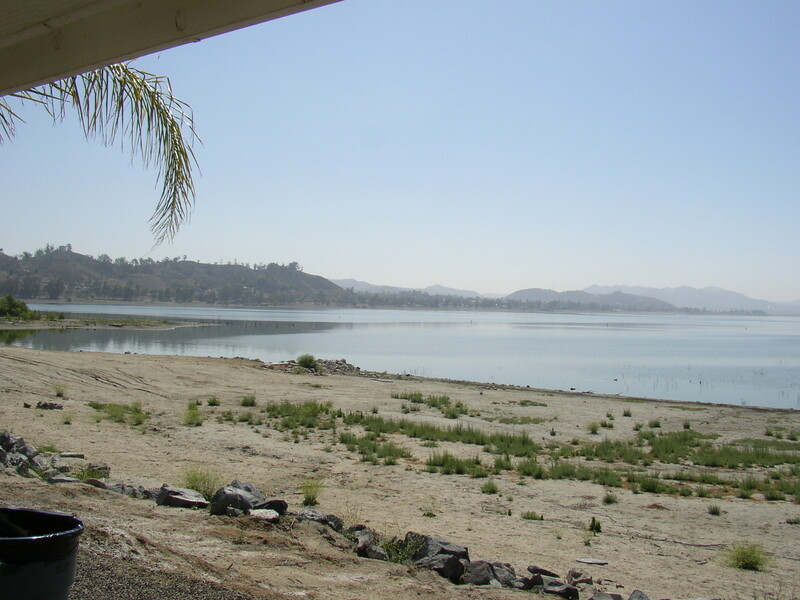 It is the largest natural lake in Southern California. What does “natural” mean? Not man made. We didn’t build a dam and let water back up here. 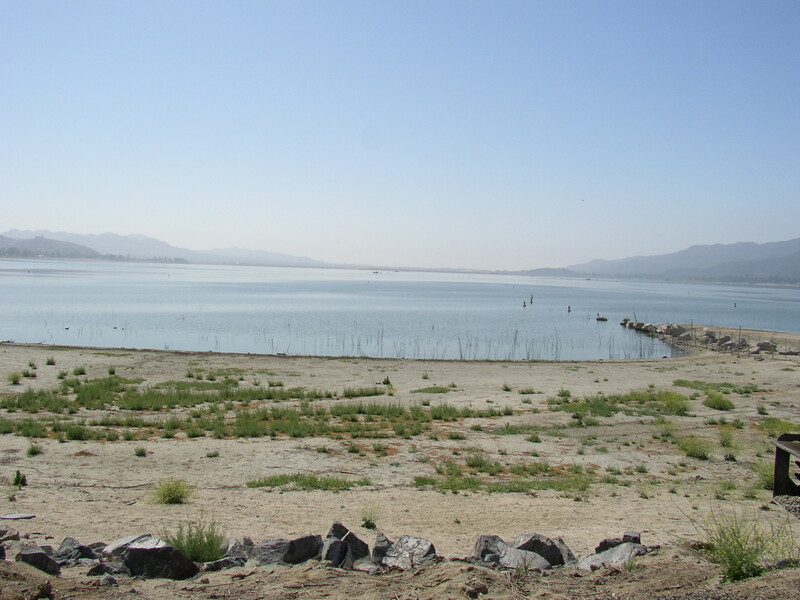 Lake Elsinore is in a natural basin. Water flows in from the San Jacinto River. Some work has been done over the years to keep the level of the lake stable via an outflow mechanism, but it basically remains a natural lake today. My only prior experience at this lake was as a child, on an early boating trip with my family. I remember two things about this trip. Yards and yards of mud along the shore, and a mishap at the launching ramp that could have been a disaster. I don’t know what caused all the mud to be there, and there was no mud on this trip. The launching ramp incident was scary. 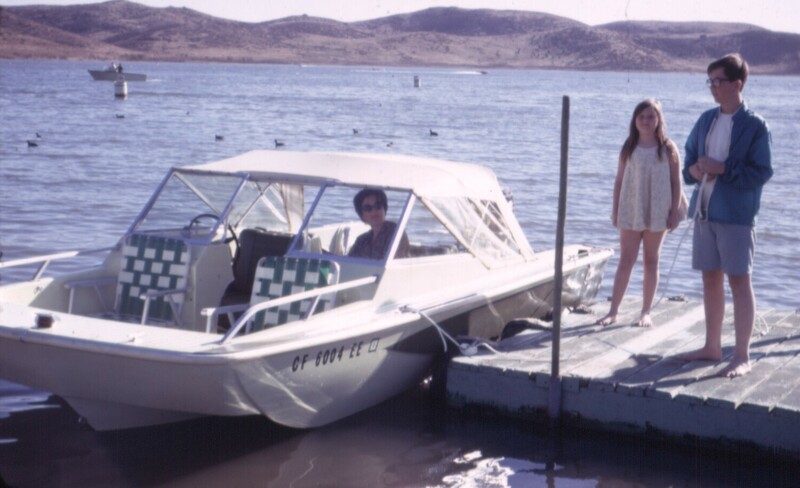 My Mom was backing the boat down the launching ramp when the brakes in our ’64 Chrysler Newport gave out. The emergency brake was the only thing that stopped our car from rolling all the way into the water. 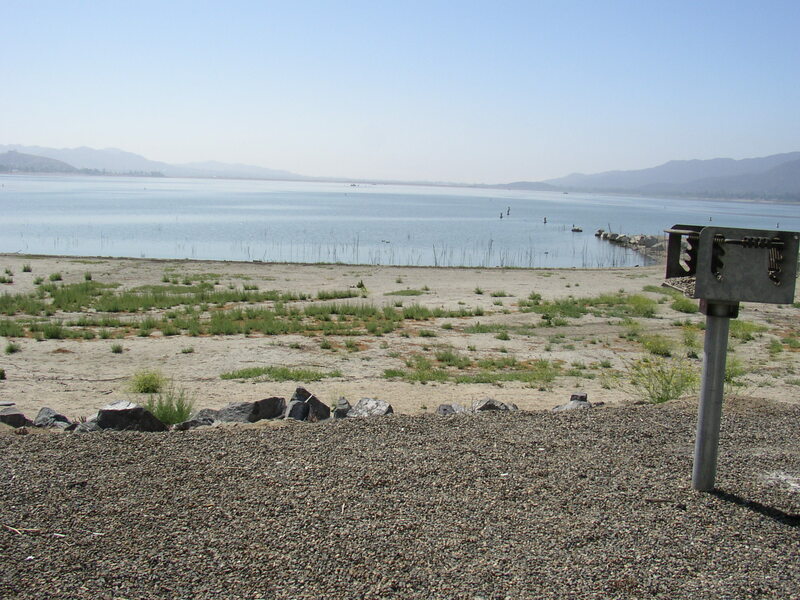 I remember reading about Lake Elsinore as a Jr High kid, mainly because of the famous dirt bike race that was held there from the mid 60s to the mid 70s. This race drew famous participants like Steve McQueen and Malcolm Smith. Honda named it’s first line of competition dirt bikes after this race….The CR250M Elsinore. In the mid-70s, violent outlaw bikers stared showing up to this event, causing so many problems that the City of Lake Elsinore had no choice but to shut it down. The event was brought back in 1996 and continues today, on a provisional basis. The campground turned out to be nice, but I would not call it a “Resort”. It’s a pretty large facility, and it does have some nice features. 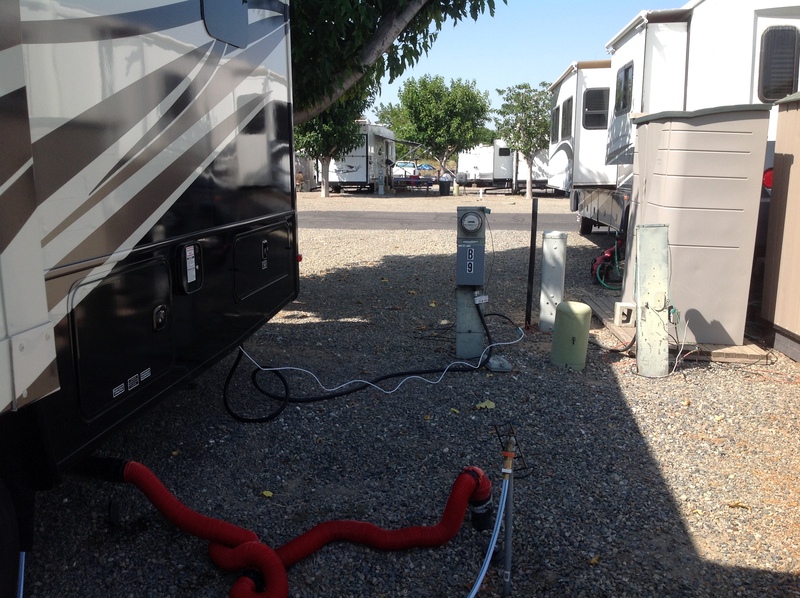 There were the usual full hookup facilities for RVs on wide gravel spaces, with a mixture of 50 amp and 30 amp outlets that appeared to be randomly placed. There was sewer, water, and cable TV. Note long term “full timer” stuff next to us….storage lockers/sheds. The Olympic sized swimming pool was nice. We used it a couple of times. 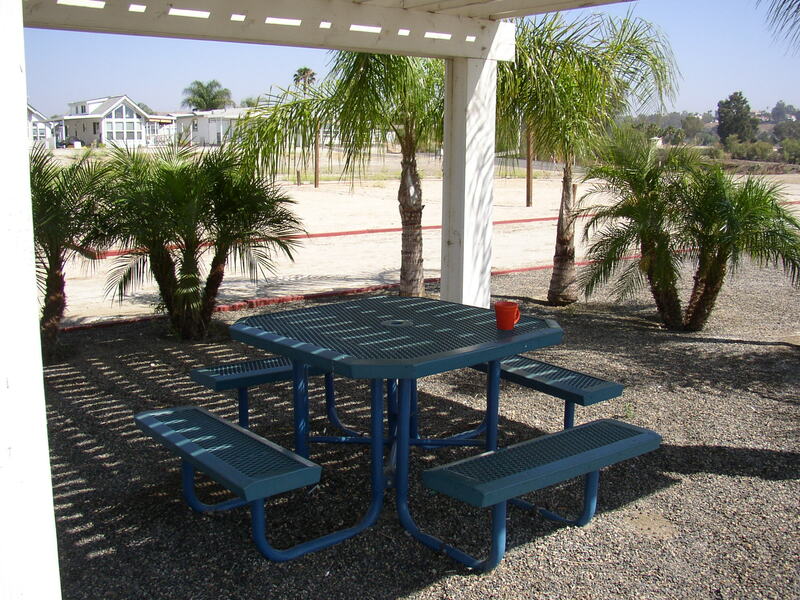 There are BBQ facilities by the pool with a large gazebo and tables. With all of the trees, it was fairly cool in here even during the heat of the day. Gazebo and BBQ facilities by the pool. Two gazebos are next to the lake with tables and BBQs. This is a charming feature, but I didn’t see anybody using them. There was work being done in this area….note the bulldozer. They are spreading gravel on a large flat area towards the rear of this photo. Apparently this new area will be for RVs, but with no hookups. 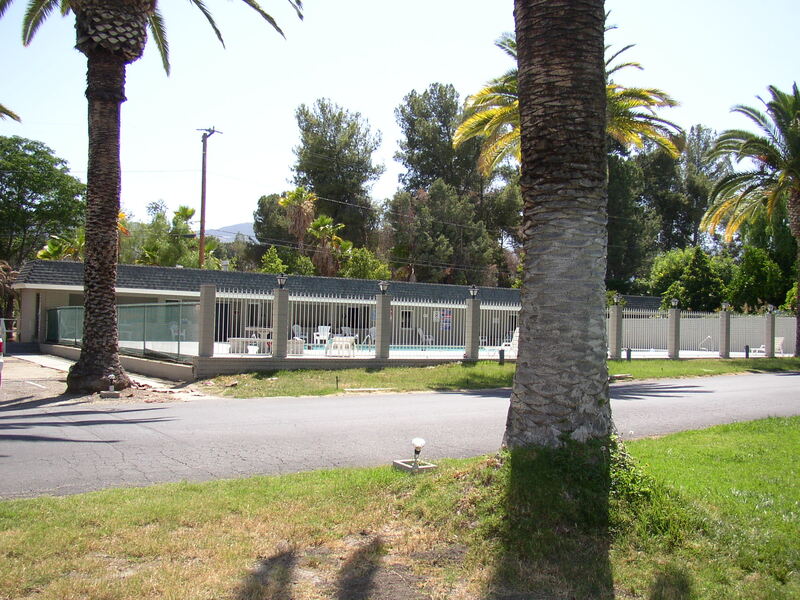 There is a large grassy area across the road from the Pool, with rental “cabins” to the right. 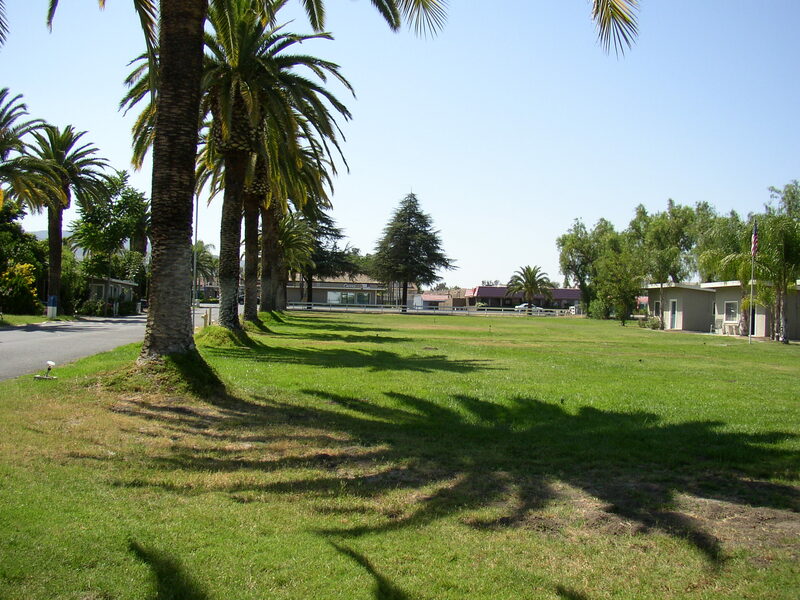 Large grassy area. Cabins are off to right of picture. Note businesses across the Hwy. One is a Mini Mart. 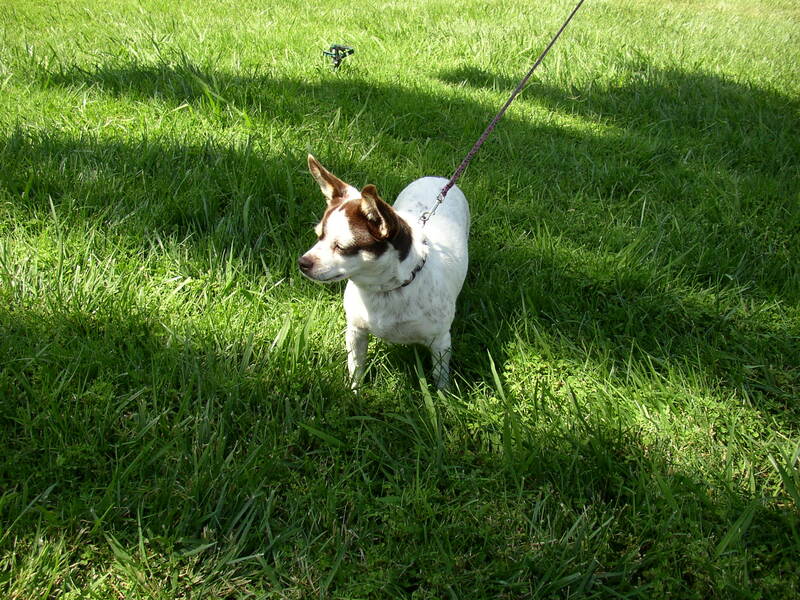 Our dog enjoyed the grassy area. Izzy on the grass, enjoying the sights, sounds, and smells. 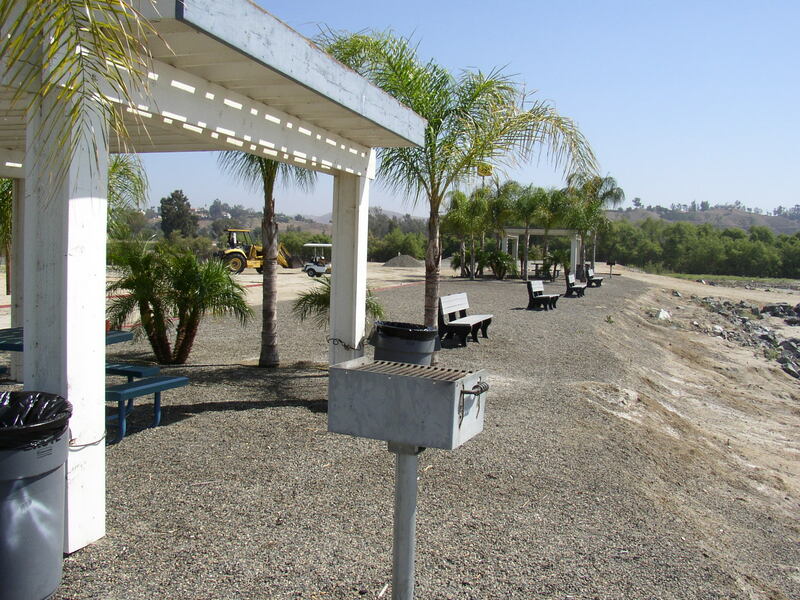 The best spaces in the park overlook the lake, but all of those spaces contain park model trailers. Park models appear to be short single wide mobile homes. You can see one of them in the background of this shot. It’s between 300 and 400 yards of walking to get from the regular RV area we were in to the lakeside. There is no sandy beach……it’s basically dried dirt with rocks. Branches stick out of the water. No beach….dried mud with bushes sticking out of the water. Wouldn’t swim here. Next to the Lake Park is a launching ramp and parking lot belonging to another facility. It was busy on Sunday but deserted during the week days. This facility has many full time residents. I saw a lot of Class A motor homes and 5th Wheel trailers that didn’t look like they had been moved for many months. There was a bus conversion next to us, which had flat rear tires and bricks around the edges. 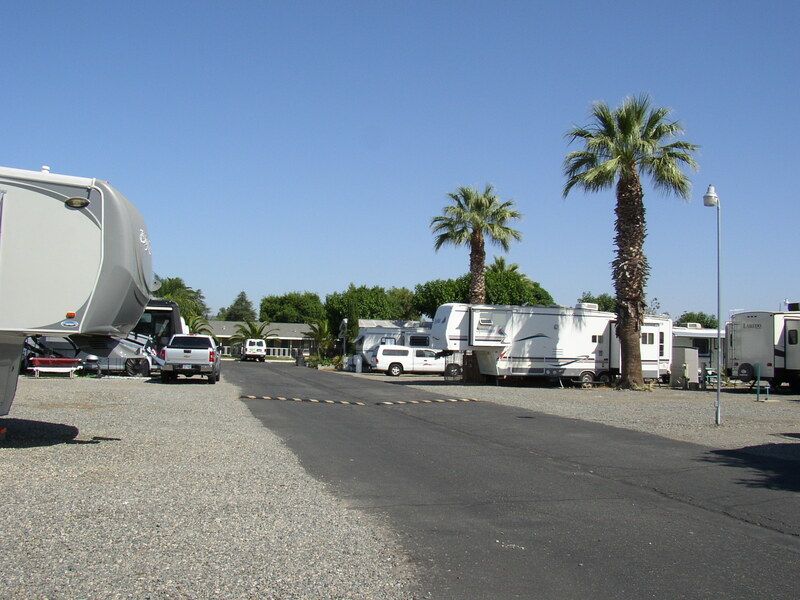 There are three main “streets” that have RV spaces on either side. Here is a typical view. There were quite a few open spaces available. Looking down one of the streets. Many long term guests here. At the end of the road you can see the “Motel” rooms. I would say there were 30-40 RVs at the park while we were there, but only about 10 of these appeared to be short term guests. The spaces here are very good sized, with ample room to park a TOAD, leaving plenty of outside space to sit with a group of people. No fires are allowed in the spaces, though. Large space – the tree marks the back of the space. I’m shooting the picture from an empty space that opens onto one of the other three streets. The lake itself was larger than I expected. The water is like I remembered it from my earlier trip….brownish green. It looks a little muddy. I had planned to so some fishing, but never got around to it. Free wireless internet was available, and worked well most of the time. There were a couple of short periods where we couldn’t connect, but speed was good enough to upload pictures for the last article on this blog. The people here are friendly. Almost everybody waves to you as they walk by, and we had a couple of short conversations with fellow dog walkers (dogs are such a great ice breaker). 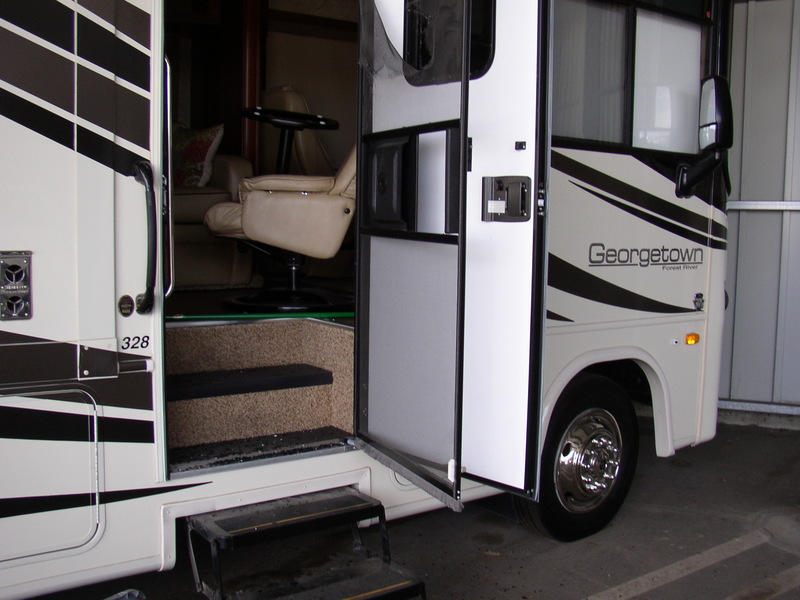 This was the first trip where the coach was situated at the right angle to use the awning. This provided shade in the middle of the day….mid morning to early afternoon. From about 3:00 to about 5:00 the shade goes away, and the sun is too hot to be outside. After 5:00 it got really nice, because one of the many trees in the park shaded most of the passenger side of our coach. 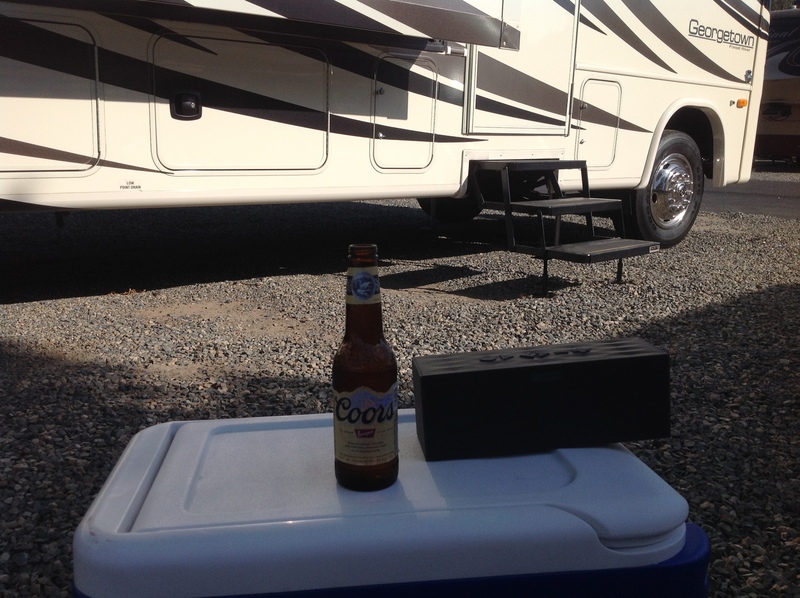 This was perfect….sitting outside in the gentle breeze, having some beer and listening to music. Very relaxing. The experiment with our cat Milhouse was a success. He was nervous at first, but by the end of the second day, he was into the swing of things. He liked sitting in the bedroom, on the little counter that has a window, watching the world go by. We will take him on our future trips. 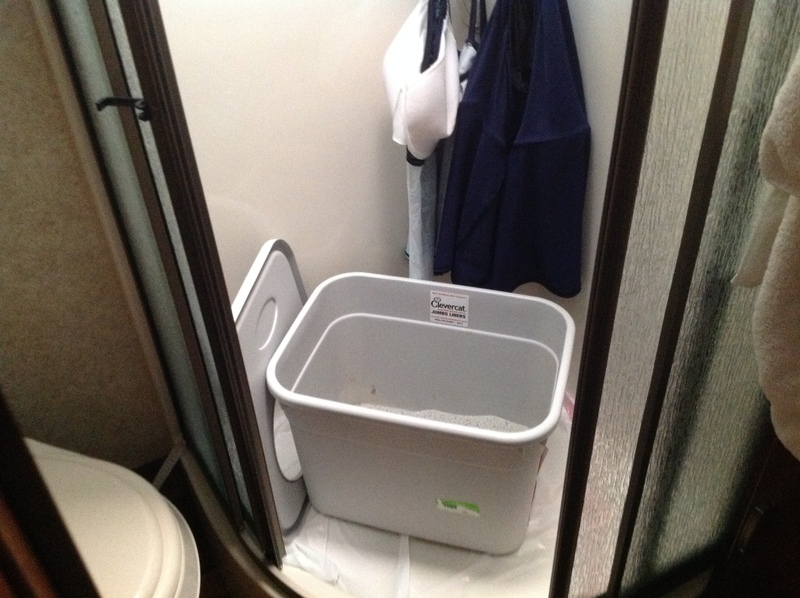 We put the cat box in the shower, with a white plastic trash bag under it to insure no litter gets into the grey tank. It worked out really well, but you have to keep it scooped out all the time! The quarters are too close for a smelly cat box. Cat box. These high sided boxes work really well. Laura and I spent a lot of time on writing projects during this trip, as we have on our other trips. I spent much of my time editing the first draft of a novel. Laura was working on writing exercises and blog posts. This is one of the things I like best about RVing so far. Being able to write in various locations is very appealing to me, and has been working out well so far. 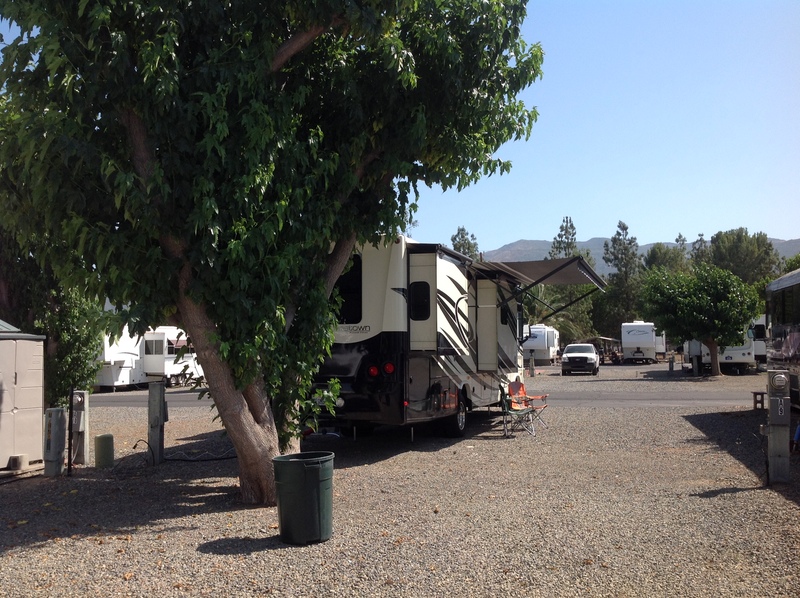 Overall, I’m pleased with this trip, and would visit this RV Park again. It had a nice laid-back vibe. There wasn’t any loud partying going on, and the people were nice. Facilities were good. 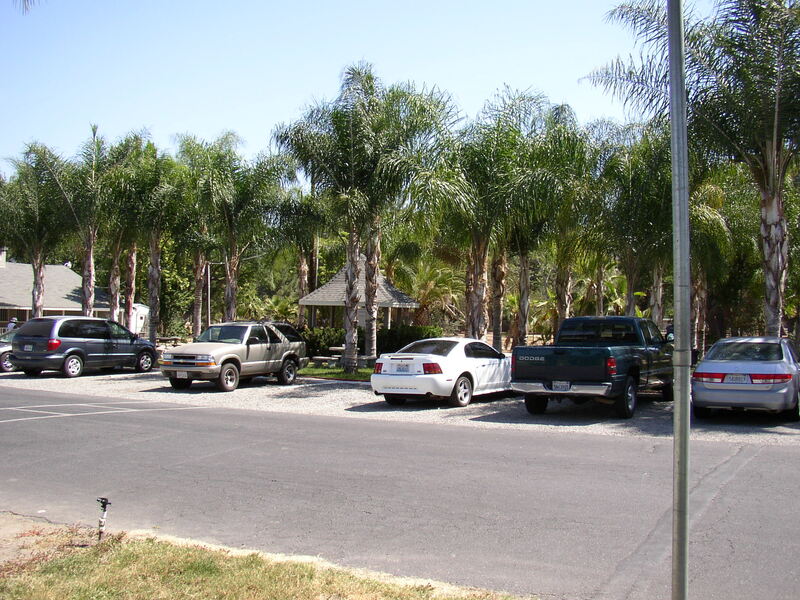 There are a couple of mini-markets and an ice cream place that are walking distance from the park, but they are across Hwy 74 (the Ortega Hwy), so you have to be careful crossing. There is a Jack in the Box next to the park that doesn’t require crossing the Hwy, which is nice. Our coach is now at the dealer’s service department. 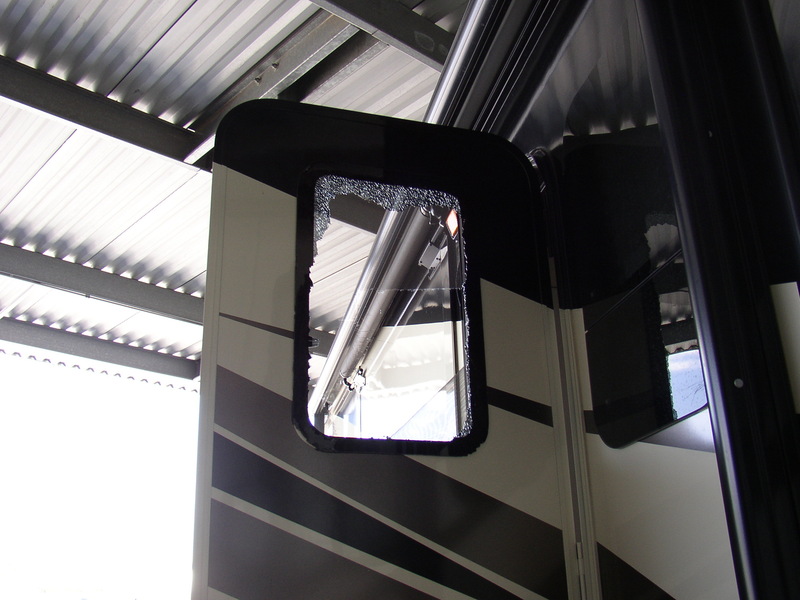 We are getting the damage repaired that happened during the recent break-ins at our storage facility. We are also getting a couple of warranty fixes done. Our black tank drain valve is leaking a little bit, and the housing for our water filter is stuck so tight that I can’t get it off. So Curious George will be laid up for a couple of weeks. Can’t wait to get her back, and go on another adventure! The Cat’s First Camping Trip! 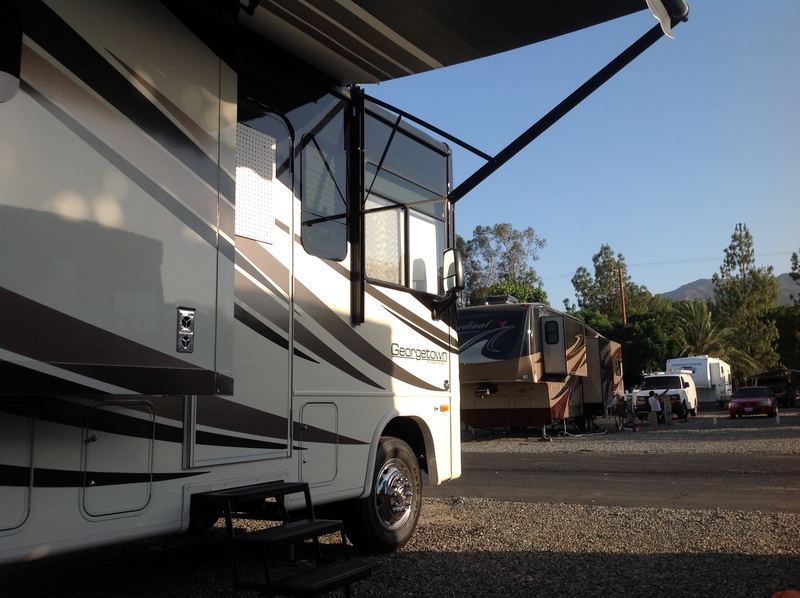 Here we are, out in the RV again, at Lake Elsinore. I’m sitting at the dinette, staring at the pegboard that covers our broken window. When I look at it, I get a twinge, but it will be made right. I’m glad we didn’t have to postpone this trip due to the break-in. Temporary pegboard “fix” for the window broken last week. We are trying some new things on this trip, setting ourselves up for the succession of short trips we will be doing over the next year or two. A focus of this trip is our cats. We have two. Milhouse is going to travel with us, and Stanley will stay home. Stanley is an outside cat. He is now 17 years old, and he is a family fixture. Stanley grew up with my four boys, and he’s a real character…..having more personality than any cat I’ve ever had. 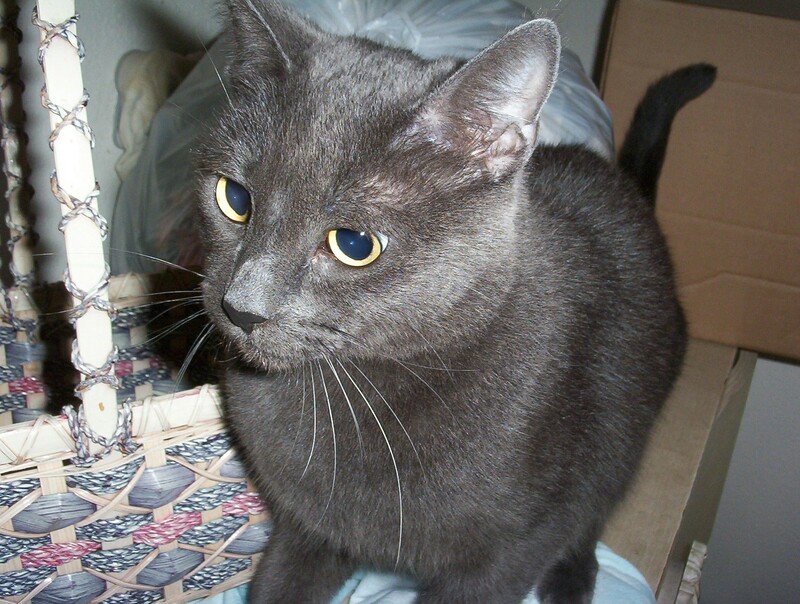 Milhouse is much younger, at around 11 years old. He is really my stepson’s cat, but Adam couldn’t take Milhouse with him when he moved out, so he is with us for now. He’s the most laid-back cat I’ve ever been around. Not much bothers Milhouse. 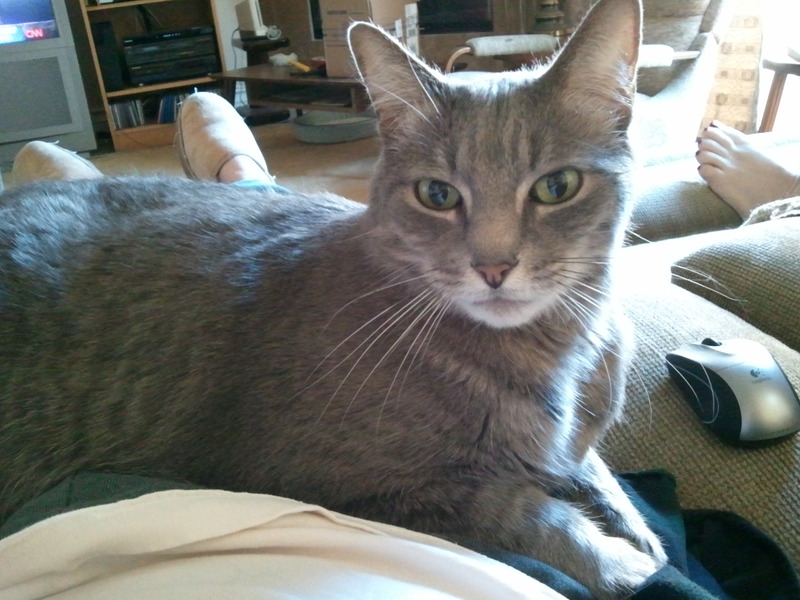 You can pick up his 18 pounds anytime…….about 10 seconds of petting and he is purring like crazy. Milhouse is the dog’s competition for our affection. It’s pretty funny to watch these two mess with each other. We are trying to get set up so we can leave at the drop of a hat, and not have to line up somebody to feed the cats and pick up mail when we are gone. My initial idea for Stanley was to put an automatic food dispenser out for him. He already has a water feeder that is good for more than a week. Adding the auto food dispenser should have allowed us to leave Stanley outside for the four days that we will be gone. Unfortunately, there was a fly in the ointment. After several days of using the automatic feeder, I started finding it moved around in the morning. Racoons. They didn’t manage to get it open and take all the food, but those critters are really smart, and it was only a matter of time. I had to choose Plan B. Leave Stanley in the garage, with the auto feeder, plenty of water, and a cat box. He’s not going to like that as much, although he loves to sleep in the garage at night. Since we live close to the coast and the garage is under the main part of the house, it never gets very warm in there. He will be safe and comfortable. Why don’t we just take Stanley? Three problems. First, at 17 years old, he’s getting pretty frail. As of the last six months, he can’t get over the fence into the backyard anymore. He hates to ride in cars, and putting that kind of stress on him at this age won’t be good. Second, he is an alpha male that sprays. A lot. He’s not in the house anymore because of that problem, and we don’t need him doing that in our new RV. And finally, he’s extremely curious and hard to control. 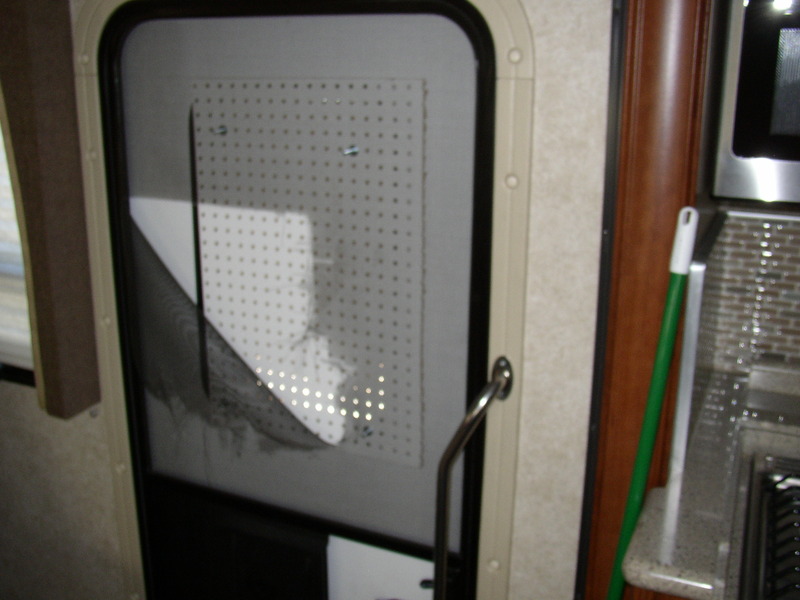 He would be constantly trying to bolt out the door of the RV. The last thing I want is for our Stanley to take off and become coyote food. Milhouse is another matter. He doesn’t have the bad habits that Stanley does. He’s also a male, but he never sprays. He won’t bolt out the door….he’s allowed outside at home, but he never stays out more than a few minutes, and he never leaves the back yard. He adapts well to just about anything. So how has Milhouse been taking trip so far? He didn’t like the car trip out to the storage yard very much. We had him in his carrier. He meowed pretty loud at first, but about 20 minutes into the trip he had quieted down almost completely. 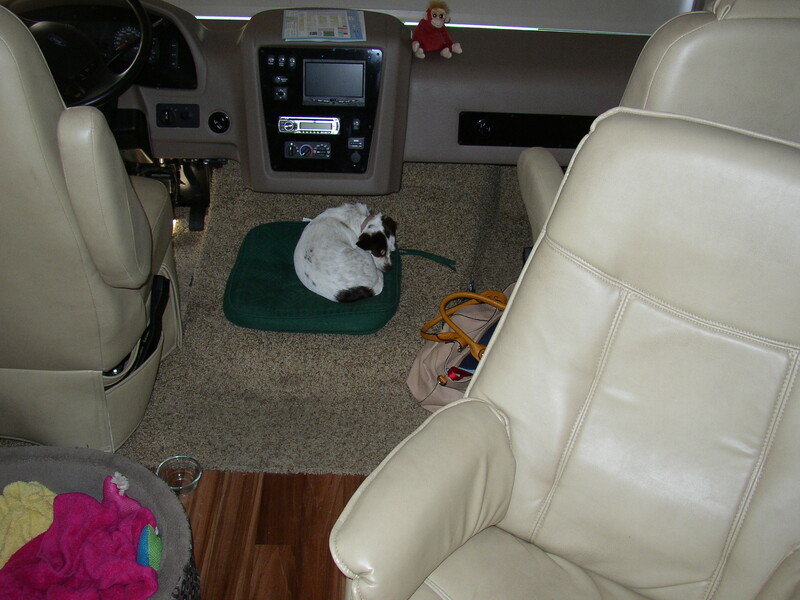 Once we got to the coach and started the drive to the RV Park, we put his carrier under the dinette and opened the door. He just sat in there until we arrived at the park. He was quiet the whole time, which surprised me since the RV moves around a lot more than our Honda Accord. We did put a harness on Milhouse. In fact, he’s been wearing it for the last several weeks. He hated it at first…he would slink around the house like somebody was pushing down on his back. He got used to it after a few days. 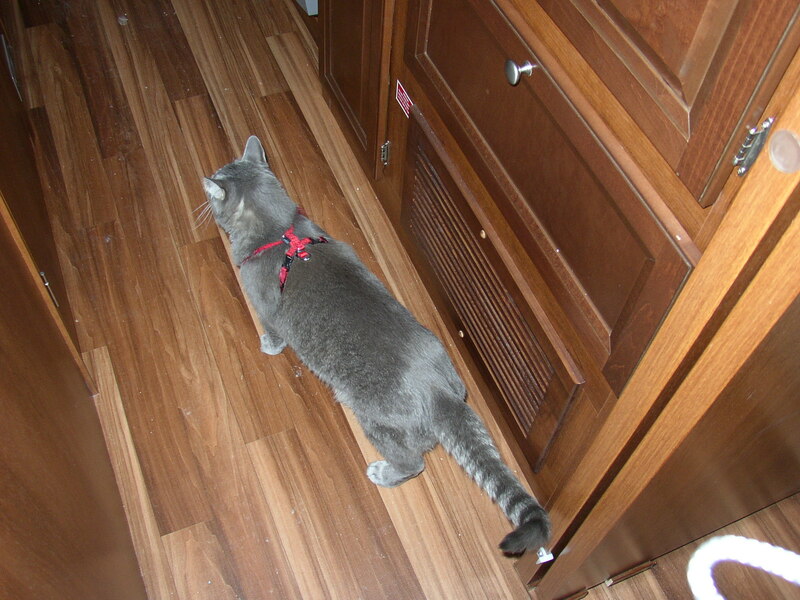 Milhouse exploring the RV. Note red harness. Now Milhouse has the run of the coach, and he seems to be adapting well. He’s eating fine, and using his cat box too. 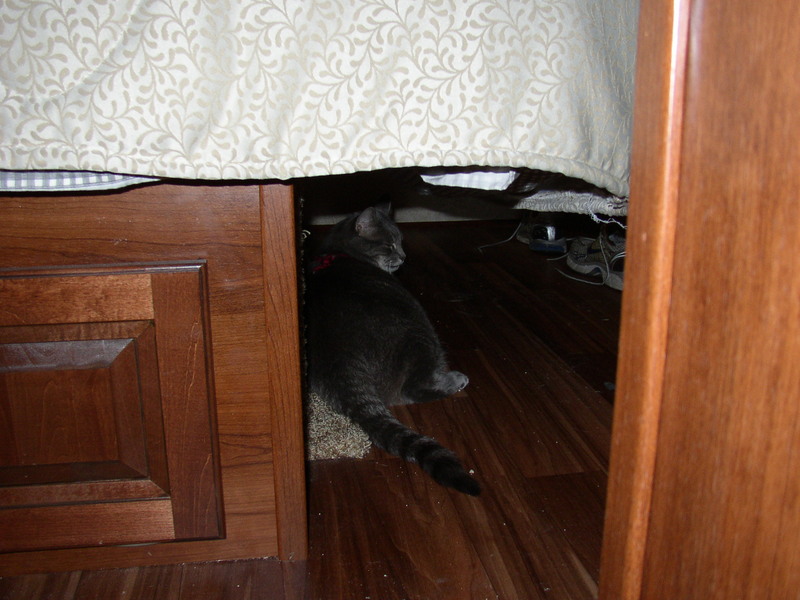 He found a quiet place to sleep under the end of the bed. Milhouse under the end of the bed. Leave me alone! The biggest problem we’ve had so far is keeping the dog from wolfing down her food and then trying to eat Milhouse’s food. They eat at the same time at home, but we always feed the dog out in the backyard, and Milhouse inside. We’ll probably start feeding Milhouse his canned cat food right as we are taking the dog for a walk from now on, so he can eat in peace. Luckily, the dog doesn’t like dry cat food. She leaves that alone. 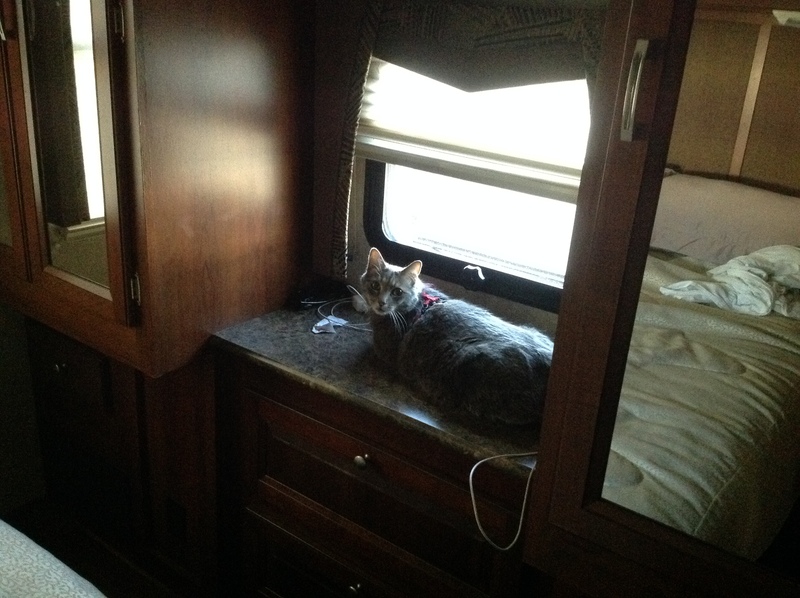 I don’t know if Milhouse will ever like RV trips as much as he would like staying home, but he is tolerating it already. He even jumped up on the dinette bench this morning for some cuddle time. This is going to work out fine. The jury is still out on how our dog likes her “brother” tagging along. So far she’s been pretty well behaved. Izzy and Milhouse tolerate each other at home, but now they are in a lot smaller space. Time will tell. We won’t know for sure how Stanley fared until we get home, of course. We’ll see. As of right now, I’m just glad to be here. Great place to write and relax. It’s post time! Kicking back in the shade and warm breeze with some Banquet and some music. Bug Out! Boxed Set Volume 3 is out! Here’s a taste of Stolen Youth, released last night in the Kindle Store and Kindle Unlimited. Published tonight, from my motor home in Salt Lake City! Bug Out! California Book 9 has just been published! Here’s a taste of the upcoming Bug Out! California release.